Small town ministry presents many challenges in the twenty-first century. Most seminaries are in major cities and likely focus on ministry in the context where they exist. With most seminaries in urban places, many seminary students have their first ministry experiences in city and suburban churches. These churches are often large enough to hire interns or part-time staff members for age graded ministry. So, what are the odds of staying in the city your entire career? Not good. At some point in your ministry career, the likelihood of serving in a small town church seems high. This is especially true if you transition from the role of an associate minister to senior pastor. In fact, the majority of churches in the United States are in small towns. Many friends from seminary and I have made this kind of transition and nearly all of us are serving in small town churches. Programs and ministry models that might flourish in suburbia or the inner city might not work at all in a small town. The churches where many ministers learn to do ministry are often nothing like the churches in which they find themselves serving. Ministering in a small town may mean adapting to different views of ministry. Most searches for small town ministry resources come up dry. Few resources exist for rural churches compared to the resources targeting larger urban churches. A simple search on Amazon reveals that nearly every book on church growth, missional living, youth ministry, children’s ministry, pastoral care, and other areas of ministry, tailors to churches in urban and suburban environments. Most ministry related books do not address in any way the unique challenges of small town ministry. This is why I’ve compiled a list of books here, a list of peer reviewed journal articles here, and a list of small town ministry organizations here. Enjoy! Many assume that small town churches are on the decline. Or worse, some suggest the impending death of small town ministry due to increased urbanization. This assumed decline works to make the lack of resources available to a small town church even more clear. It even makes some ministers think twice before serving in a small town church. If future ministers never receive training for small town ministry, and if those ministries are not properly resourced, decline will become inevitable. In order to face these three challenges, ministers should become students of the culture they serve in. In a small town, community and relationships are critical. People may have differing views of morality compared to those living in metropolitan areas, and rural economies may struggle to compete with distant cities and suburbs. All this, and we haven’t even touched on health care, education, and labor market challenges! In order to effectively shepherd a small town church, ministers need to know the culture, not only of the congregation, but of the community. Unfortunately, the educational system is rigged (and I believe unintentionally so) to favor urban models of ministry. 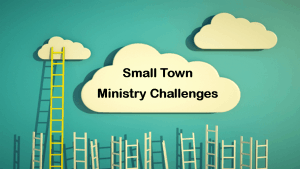 What challenges do you see in small town ministry? Let’s have a conversation about challenges in ministry as you see them. I look forward to your comments below!